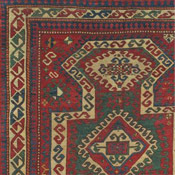 The finest 19th century Kazak rugs are long prized by connoisseurs of Caucasian rugs. Kazak is in the Republic of Armenia, directly to the north west of Lake Sewan. 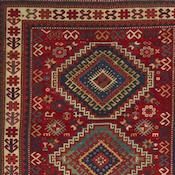 “In weaving terms, Kazak is probably the most famous area in the Caucasus, for the best of the rugs produced there…combined stunning geometric designs with fabulous colors derived from high-quality dyes. 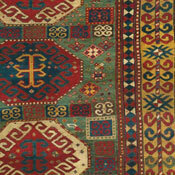 It is possible to attribute some weavings from this area to specific villages, but when a piece cannot be precisely identified it is known simply as a Kazak or by reference to the design” (Middleton, Michael, Rugs & Carpets: Techniques, Traditions & Designs. Mitchell Beazley, London, 1996, p. 52). 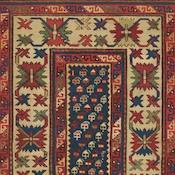 The best antique Kazak rugs are long prized by connoisseurs of Caucasian rugs (and folk art as a whole). One reason is their robust aesthetic and incredibly saturated naturally dyed color tones that account for this tremendous appeal. 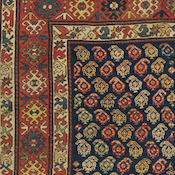 Unlike other antique rug styles, in many 19th century Kazak carpets, large archetypal motifs dominate the field, with majestic proportions that magnify the powerful effect of these iconic designs. 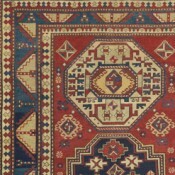 An example is the rug to the right. This high mountain antique tribal rug’s color range is entrancing, highlighted by an expanse of prized green shifting to dark forest to jade to spruce tones via expertly conceived abrash. 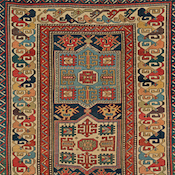 “Known for their bold designs, harmonious colors and good-quality dyes, some of the most spectacular geometrically designed piled rugs found anywhere in the East originated in the Kazak area of the Caucasus during the 18th and 19th centuries. 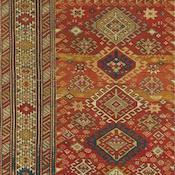 Produced by both the Muslim and Christian communities (the latter evidenced by the large numbers of rugs with dates in Roman numerals), they have long been coveted by collectors” (ibid, p. 52).